← W. Dale Nelson at the AHC, March 22 @ 3pm! A finding aid for the previously unprocessed Roger Q. Williams papers has been created. Williams (1894-1976) was an early aviator and barnstormer of the 20thcentury. He is perhaps best known for his flight with Lewis Yancey from Old Orchard Beach, Maine to Rome, Italy (the flight included a short stop in Santander, Spain for parts). 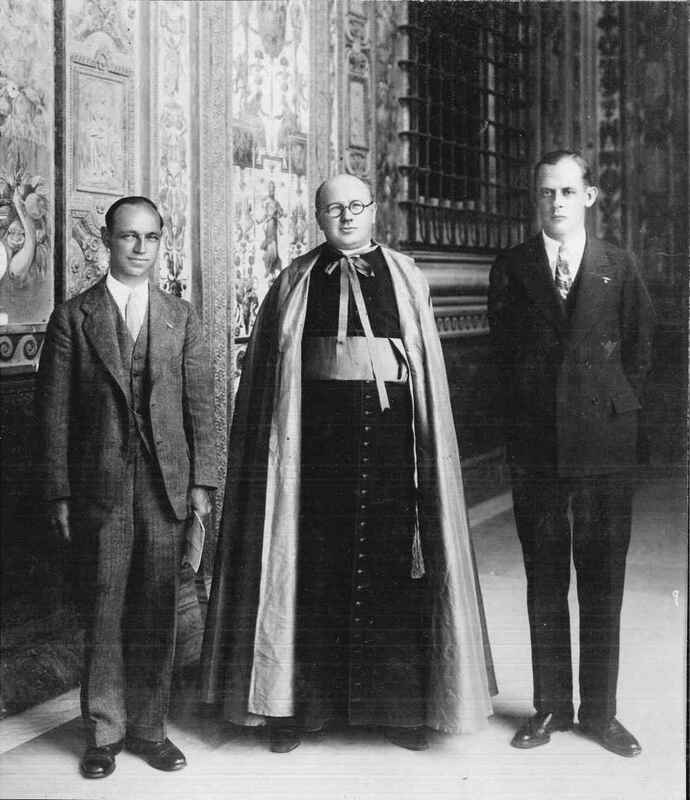 Williams and Lewis Yancey after their flight to Rome in 1929. Roger Q. Williams papers, Box 14. “Roger Q. Williams, ca. 1917-1964, undated.” American Heritage Center, University of Wyoming. It broke the previously held over-water nonstop flight record. He served as a pilot in the U.S. Army Air Force during World War II and later established his own flight school, the Roger Q. Williams School of Aeronautics. Williams took time to write of his experiences as an aviator in a weekly syndicated column, “Up Currents,” and a book, To the Moon and Halfway Back. 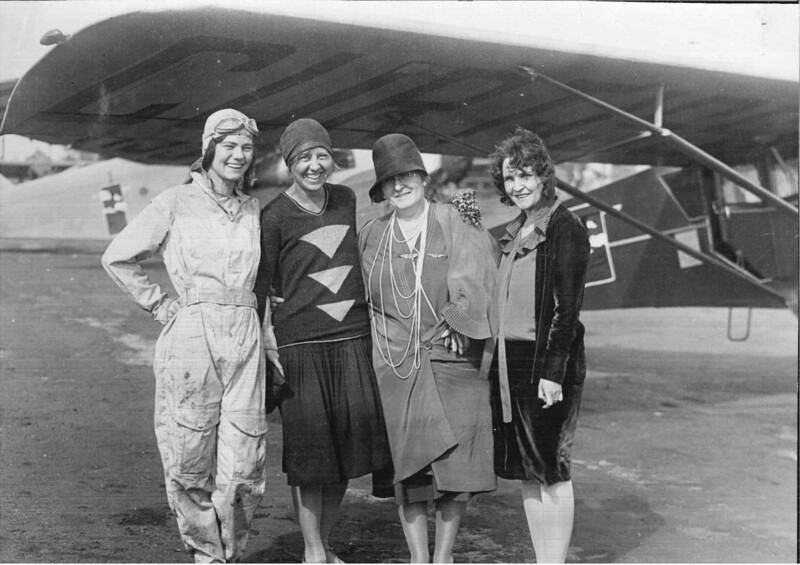 Thea Rasche (triangle sweater) with Francis Harrell (at right), female stunt pilots, 1927. Roger Q. Williams papers, Box 14, “Thea Rasche” folder. American Heritage Center, University of Wyoming. The Roger Q. Williams papers document the career of Williams but also contain a wide selection of photographs that are much like a who’s who in aviation from the 1920s to the 1940s. Additionally, historical aviation and geographic photographs collected throughout his career are present in the collection. Hello. My name is Kristie Conrad Connors. My Granny Conrad’s, Uncle was Roger Q. Williams. I recently learned of this from my grandmother who sent information from an old newspaper clipping of his amazing crossing of the Atlantic. My Grandmother Martha Conrad, from Ohio, is still with us and residing in the Sunshine State. Unfortunately, like many families in this modern age, I’ve lost touch with many of mine. I would love to reconnect with lost family members. My Grandmother has a good many memories connected with Roger. I can only imagine what else awaits. Your great Uncle is my Dad’s Uncle. As a very young child I remember the stories Col. Williams told my sisters and me, on a few short visits during family occasions. I was too young to put context to geography when we met him. I’m fairly certain, I have copies of poetry he wrote. My Dad is still with us. Our family is from Western New York but grew up in Ohio. It would fascinating to share connections. 24 votes for Honey Kleugh. What is the meaning of 24 votes for Honey? Thank you for the question Lynette, one of our reference archivists will look through the Roger Q. Williams and see if they can find an answer for you. Questions can take up to 60 days to be answered. 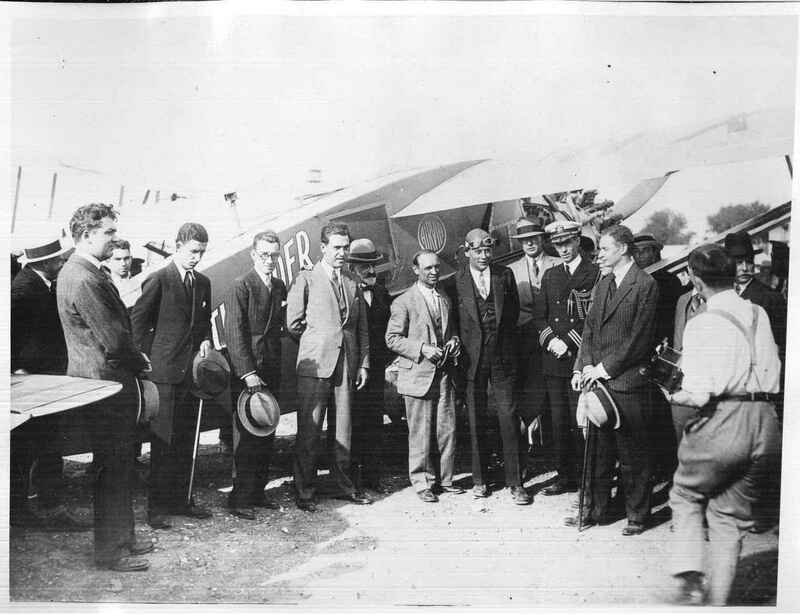 Roger Q. Williams and Lewis A. Yancey took off from Old Orchard, Maine in the plane “The Pathfinder” on July 8, 1929, with the goal of flying non-stop from Maine to Rome. Due to weather conditions, they did not have enough fuel to make it all the way to Rome and landed in Santander, Spain on July 9. Despite not making their original goal, their flight from Maine to Spain was the longest transatlantic flight that had been completed up to that point. The morning of July 10 Williams and Yancey had replenished their fuel supply for “The Pathfinder” and took off for Rome, where they landed later that day. Because of the issues they had faced with fueling needs and space available on the plane, the two men decided to take a ship back to the US instead of attempting to fly back. Their ship returned to the US on July 27, 1929, docking in New York City. A parade and reception were held in their honor in NYC on July 29, 1929. In May 1930, Lewis Yancey embarked on a 25,000 mile flight through the Americas, with Emil Burgin and Zeh Bouck in the plane “Pilot Radio”. The plane crashed and was entirely burned on September 12, 1930 in the Bahamas; no one was injured. Yancey sailed home to New York City after the crash. In searching through this history, I was unable to find any references to a “Honey Kleugh” or anyone with a similar last name and I am also unsure what the “24 votes for Honey” might have referenced. I am sorry that I am not able to answer your question on what that portion of the inscription is referencing, but I hope that this contextual information is useful to you.